I’ve always been intensely curious about how the world around me works. From asking my Dad as a young child how gasoline made the car go to learning how a turbo-fan engine generates thrust in Air Force Aircraft Maintenance School, I have been passionate about understanding the principles behind how things work. As a believer in the Lord Jesus Christ and a student of God's word, this life-long quest has led to the discovery of underlying truths that go beyond the standard arguments of competing points of view that sometimes divide Christians. This is especially true concerning the subject of the return of Christ and related issues like the rapture, the Antichrist, and the Book of Revelation. Much of what I have discovered is not well known, however, leaving many people unprepared for events that are about to hit the world like a run-away freight train. My desire to address this urgent need is what motivated me to write OVERTAKEN UNAWARES. 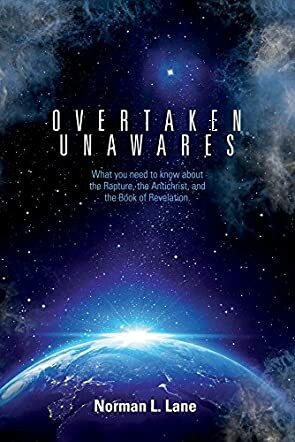 In a timely, interesting and thought provoking new book in the genre of Christian study, Overtaken Unawares: What You Need to Know About the Rapture, the Antichrist, and the Book of Revelation, debut author Norman L. Lane has done a great job of providing his readers with a book they can really sink their teeth into. Focusing on questions surrounding the Rapture, and things that Christians and all people can expect before, during and after that time, this book serves as almost a guide for readers about the time of the end. Author Norman L. Lane has completed extensive research in this area, and his readers will certainly appreciate his thoughtful and careful work. I very much enjoyed Overtaken Unawares. Once I started reading, it was very hard to put down. The information was spot on for any person wondering about specific details of the Rapture, from information as basic as where to find information in the Book of Revelation, to things about the Antichrist and his work in the world today, all the way to what people should be watching for and preparing for in this moment. Any reader of the Christian faith would find this book highly interesting and should certainly read it; readers of other faiths should also give this book a chance if they want useful information on this tenet of the faith of many people. I am pleased to recommend this book. I would be very interested in reading more from the talented and promising author Norman L. Lane in the future, and certainly hope that he is hard at work on another such book as we speak!